Trichosanthes dioica is also known as the pointed gourd, parwal (from Hindi), or potol (fromAssamese, Oriya or Bengali (পটল) pôţol). 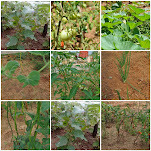 It is a good source of carbohydrates, vitamin A, and vitamin C. It also contains major nutrients and trace elements (magnesium, potassium, copper, sulfur, and chlorine) which are needed in small quantities, for playing essential roles in human physiology.It is a vine plant, similar to cucumber and squash, though unlike those it is perennial. The fruits are green with white or no stripes. Size can vary from small and round to thick and long — 2 to 6 inches (5 to 15 cm). I am actually copying almost the whole Wikipedia article on Parwal just because from my own experience I know there are a lot of people who never have seen or eaten this vegetable. I dont know why but there is a big bunch who actually hate this so much that they even refuse to try this even once. Well I don’t belong to them rather on a contrary this is my most favorite summer vegetable. I love it so much that during pregnancy when I detested almost everything even then I ate full meals only with a light parwal stew. I belong to a Parwal loving family where summer meant many delicacies with parwal. My Maa makes a whole parwal curry which is finger lickingly delicious. Apart from this we Bengalis cook a variety of savory and sweet dishes with green parwal, ripe parwal and even with parwal peels. 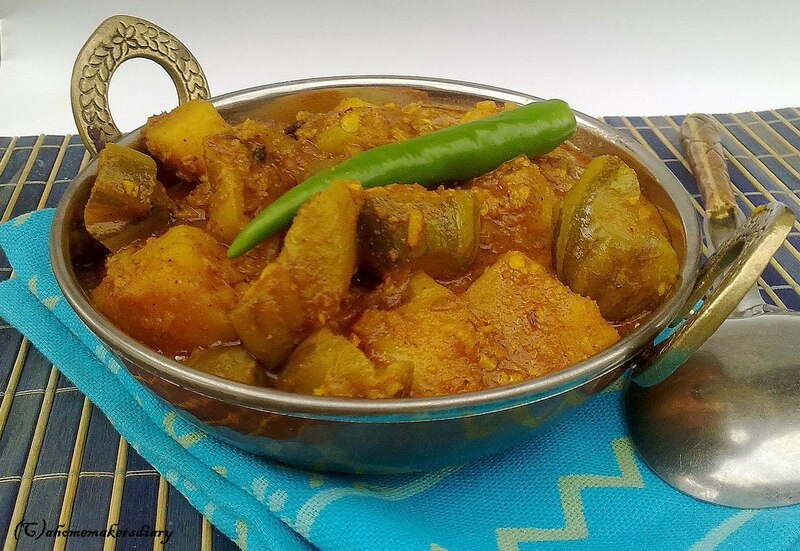 Though the most famous Bengali Parwal dish is patoler Dolma or Parwal stuffed with spiced veg or non-veg stuffing and cooked in a creamy gravy. Once after my marriage we invited some of his friends for dinner and I painstakingly labored in the kitchen to prepare prawn and coconut stuffed parwal. I sang its praises before dinner until 70% of them declared that they hate Parwal. So the statutory warning here is before cooking this veggie for your guests make sure that they like it. Luckily Hubby is fond of this and for that matter he pretty much loves all the veggies. 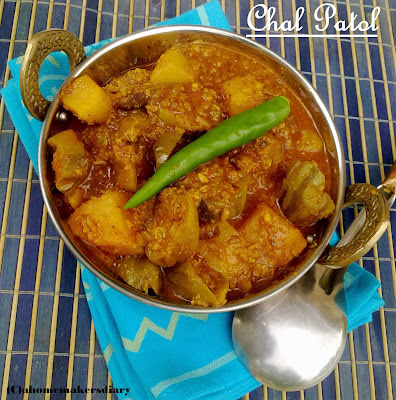 Apart from being a popular veggie Bengalis have a fascination with the word Patol and its shape. A girl with a doe shaped eyes are often referred as Patol chera chokh. The plant is cardiac tonic and antifebrile. Its decoction with chirata and honey is given in bilious fevers as a febrifuge. A decoction or infusion of the plant is an efficacious remedy for boils and worms. The leaf juice is rubbed over the scalp for the cure of alopecia. Powder of the dried root is very effective in curing ascites. A decoction of its leaves with chebulic myrobalan taken in the morning on empty stomach is an age-old remedy for acidity and bilious disorders. Leaf juice is an age-old remedy for liquor poisoning. Here in Bangalore this is quite an expensive vegetable and we hardly get to see the fresh produce. This week Hubby got some real fresh and perfectly shaped patol from our local veggie market. A Look at the bag and my heart sang to me Chal Patol. Chal in Bengali means rice which gives this dish the distinctive aroma. 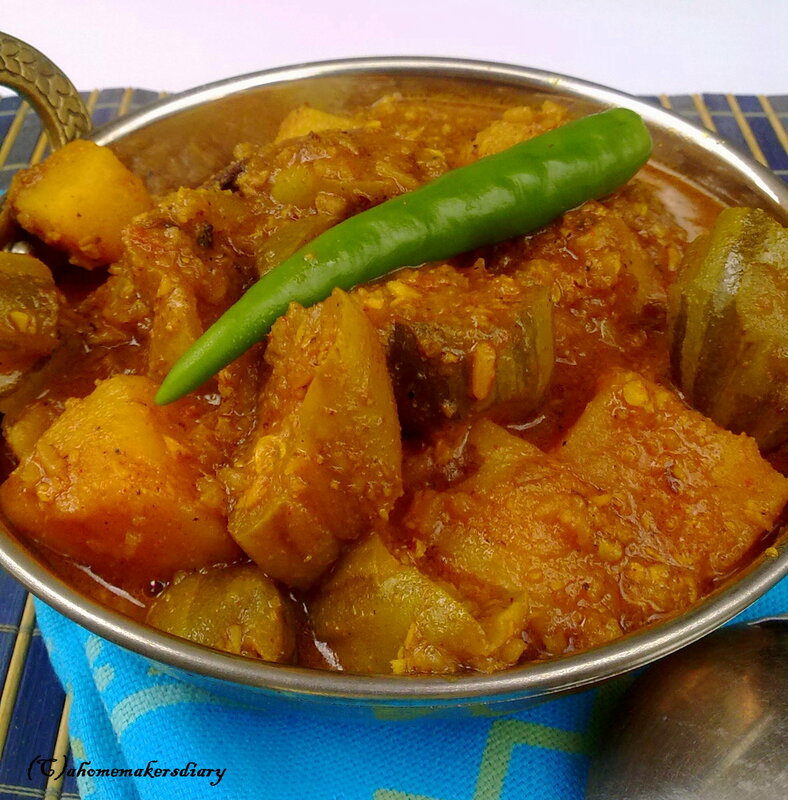 This is an authentic Bengali vegetarian dish cooked with aromatic Gobindobhog Rice (kalijeera rice) and coconut. This is actually cooked without onion and garlic but some people also add prawns to it. Wash the parwal, trim the edges then peel skin at 2 or 3 places lengthwise. Cut them each in 3 or 4 pieces depending on the size. Peel potatoes and cut in cubes. Now smear a little bit of turmeric and salt on the potato and parwal and keep aside. Mix all the spice paste and powder with 2 tbsp water and keep aside. Heat 2 tbsp oil and put the parwal first. Fry for 5 minutes and then add the potatoes. Fry till light brown. Heat the rest of the oil and temper with slitted green chillies, bay leaf, cumin seeds, cinnamon and cloves. Once the aroma hits you add the rice. Fry on low heat till the rice turns white. minute before adding the fried veggies.Add salt and cook on low for a couple of minute. Pour 1 cup water and cover. Let it cook on medium heat till the veggies are soft and the gravy coats the veggies. Adjust the water accordingly. Once done stir in the ghee and the garam masala and serve this divinely aromatic dish with rice. Side Dish showdown: June at Cinnamon and Spice and everything nice. 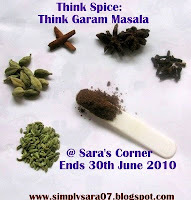 Think Spice: Think Garam Masala, a great event started by Sunita and this time hosted at Sara’s Corner. Parwal, Patal, Patol, Pointed Gourd, Alu Patal, Potato with parwal, Gobindobhog chal, Klijeera rice, Aromatic Rice, Parwal Gravy, Garam Masala, Bengali vegetable, Tarkari, Vegetables in gravy, Bangali, Niramish, Pure Vegetarian, Side Dish with rice. ahh..wht a wonderful side dish....lovely pics....i love parwal and gourds...guess wht just made bottle gourd for lunch today..
Gravy looks really droolworthy..fabulous side dish for rotis..
love prawal...its been a while I had this veggie..unfortunately I do not get to see this vegetable here in indian store...my mom would make this sabzi exactly the same except the addition of coconut and jaggery...your looks so tempting..yum yum yumm! Delicious! I had cooked with frozen Potol (never had used before that)for Bengali RCI event once. Looks good. looks very tempting and healthy dish..
Hi. Firstly thanks for sharing another unique bengali preparation and I would love to try this, the procedure and the ingredients have caught my attention. Chal potol amar kache notun ... besh bhalo gravy gravy hobe tai na? Rice dewa kintu rice er dish noye ... ami o kaal fresh potol peyechi ... ekhane pawa jaye na ... ki korbo bole jotno kore tule rekhechi .. ektu bhaja khabo ... ar ektu eta try korbo ... ruti diye khawa jabe eta? A very interesting dish and when it's authentic cuisine I am gonna try. Thanks. Thanks friends as always. your inspiring words helps to try new things. @Suman, we Bengalis like to add a litle bit of sugar almost to every dish to balance the taste of salt and chillis. you can omit as thats always optional. Did you get the bookclub link, by the way? This is one of the best potoat dish i have seen for a while. Looks so so delish. This dish looks delicious. I have often seen parwal in the Indian grocery shop here, but never tried it... 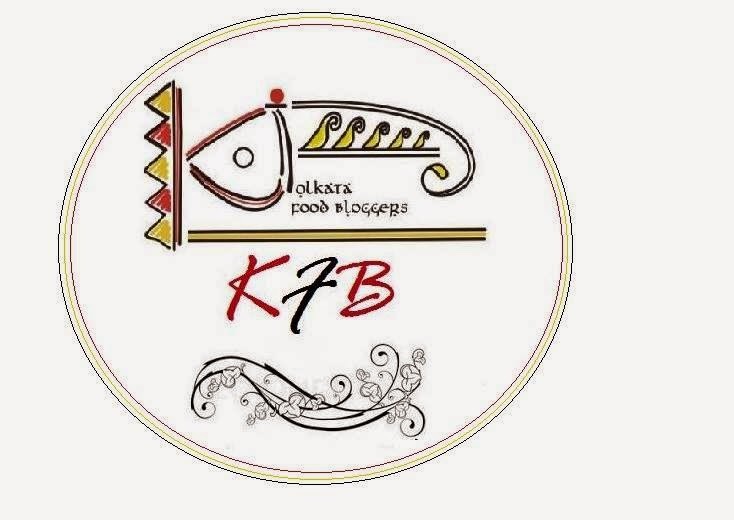 The post is so interesting, as an "adopted" bengali, I am absolutely thrilled to read all the information you are giving in your post and thus, learning more things about bengali culture and food. I am a big fan of parwal/patol and in fact having it for lunch today. This gravy recipe is really interesting! nice click..curry looks so yummy!!!! Sayantani i have never heard about this dish. I love potol and it has been many years since we ate any. ekhane praye pawai jaye na. really miss it, esp. in unique dishes like this one. Chal potol dish-ta amar kache notun. ekhane bhalo potol pawa jayee tai pra-ey ranna kori. ja hok ekta notun dish shiklam. Very nicely cooked and nicely presented too! Hey Sayantani, how have you been. 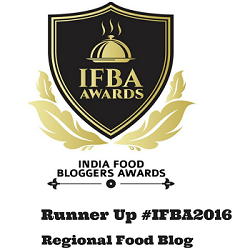 I just came back from the blogging break and have been missing many of your posts. Haven't this veggie before but the curry looks really delicious.